The latest in Wes Hibben's signature line, this Brother's Keeper Bowie will leave you speechless. 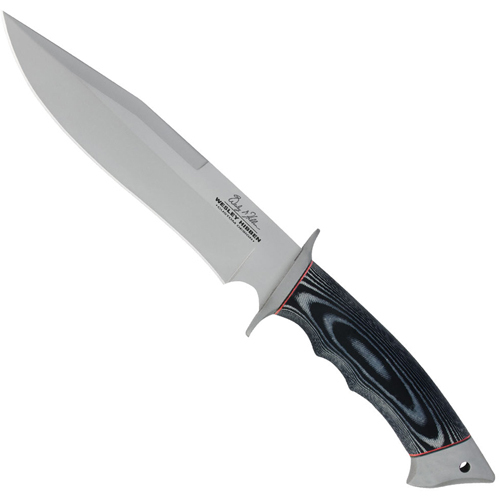 This ergonomic, tactical Bowie features a powerful, razor-sharp 7CR17MOV stainless steel blade, guard, and pommel. A commanding, premium Micarta handle completes the innovative design, providing you with a sure grip each time you reach for this blade. At 12-1/2" overall, this is a perfectly sized Bowie that will provide you with years of good use. Store or carry it in the genuine leather sheath embossed with Wes Hibben's signature.